Wanting to get married in a church in Lake Como? Italy is known for its variety of Catholic churches and Lake Como is no different. Up until a couple of years ago, getting married in a Catholic Church in Lake Como was no problem at all. Unfortunately, San Giorgio Church in Varenna, Lake Como has stopped non resident Catholic weddings and as such foreign people can no longer (at present) get married in Lake Como’s Catholic churches. Since then, many couples hoping to have a religious Christian Church wedding ceremony have decided to go to the Anglican church in Cadenabbia, Lake Como to get wed. It’s easy to see why, its stunning interior make for a very special wedding venue and the Reverend Roger puts couples immediately at ease, with his friendly relaxed Australian style…that’s right, Australian. The church celebrates several weddings for English speaking Church of England couples each year but not so many as to make it impersonal, Reverend Roger, who is also known for his great sense of humour, will happily craft the perfect service for each of his couples making your Lake Como church wedding ceremony truely memorable and touching. Being right next to the boat port means that we can easily organise a boat to wiz the newlyweds and guests to their wedding reception venue, be it just across the water in quaint Bellagio, in the lake side pearl Varenna or in one of the stunning villas dotted around the lake. Couples wanting a Catholic wedding in Italy however need not worry but will need to change lake! Lake Garda offers a number of really stunning churches, both tiny for intimate weddings to large and grand. Getting married in a church in Italy requires some paperwork, if you want to get married in a Catholic Church at least one of you will need to be Catholic and you will be required to do a course back home before getting married here. 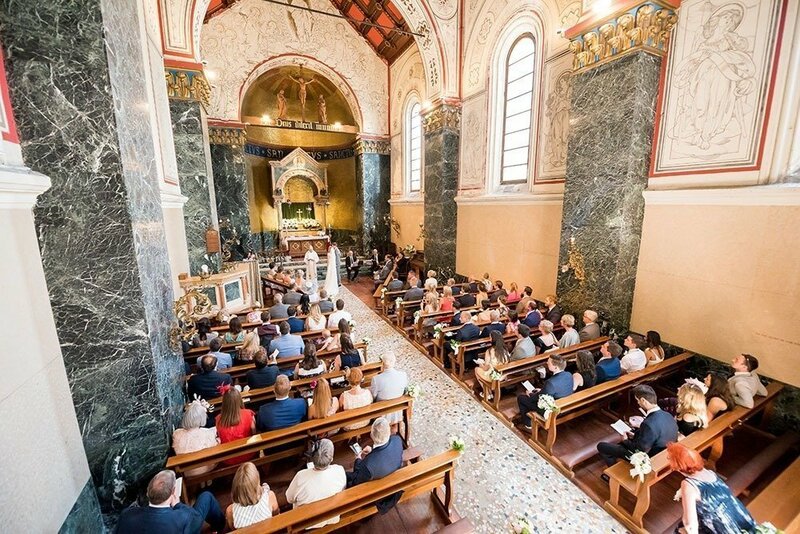 Americans often opt for a religious only church wedding as having both a civil and religious wedding requires them to come over to Italy beforehand whereas Irish and British couples will often do both. Whatever your situation, we, the planners at My Italian Lake Wedding, will guide you through every step making your Italian church wedding in Lake Como or Garda…heavenly!